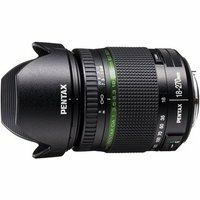 The Pentax 18-270mm f3.5-6.3 SMC DA SDM Lens is a high-magnification zoom lens that covers everything from wide-angle to super-telephoto shots. Driven by a supersonic built-in supersonic motor is the SDM autofocus system to ensure quiet, smooth and fast operation. Incorporating two extra-low dispersion (ED) elements in its optics, this zoom lens delivers bright, high-resolution images even at the edges, while effectively minimizing chromatic aberration. The 18-270mm lens is an all-around zoom lens ideal for travel photographers who desire one lens to cover all aspects of photography and to avoid the hassle of swapping lenses.